I hope this newsletter finds you well. So the lovefest for Neighborhood Councils continued this week when City Attorney Mike Feuer and EmpowerLA hosted 19 visitors from countries around the world. They were visiting the U.S. as part of the State Department's International Visitor Leadership Program and wanted to learn about the Neighborhood Council system in relation to government ethics. City Attorney Feuer was ever so eloquent in speaking about the Neighborhood Councils' important role in providing transparency and inclusiveness within City government. He acknowledged that for some in the room, standing up to speak your mind is dangerous in their countries, and he praised them for having the courage to educate themselves about how to make their home governments better. Our great Neighborhood Council Advice Division, led by Deputy City Attorney Darren Martinez, then did a mini ethics presentation. Deputy City Attorneys Carmen Hawkins and Alois Phillips helped to field questions from land use to gang problems. The international visitors and their State Department representatives left very impressed with the Neighborhood Council system. Many thanks to our City Attorney and his team along with our staffers who put this together, Melvin Canas and Tom Soong, for making this important cultural exchange happen! I have to say that both in Memphis and with all of our international visitors, everyone has been amazed at the Community Impact Statements (CIS) that are unique to our Neighborhood Councils. The ability for the community to have such an official method to weigh in on City government issues is something Neighborhood Councils definitely need to take more advantage of at every meeting. Filing CISs is even impressing our own Neighborhood Council leaders, some of whom did not know about them. As I was writing this, our Policy Director, Joe Hari, ran into my office and exclaimed, "We just convinced a Neighborhood Council board member to run again just by telling her about the CISs!" Yes, this is the kind of stuff that we Neighborhood Council geeks here get excited about so file those CISs for your communities! Our first elections start in the Valley next Saturday so we will be overlapping candidate filing with polling place work. Needless to say, it's going to be crazy. Thanks to our fantastic IEAs and elections team, led by Stephen Box, and to the City Clerk, who is processing candidates and posting pictures and statements as fast as they can onto the EmpowerLA website. Regions 5 and 6 candidate filings closed strongly, thanks to IEAs Jay Handal and Terrence Gomes. So onward! 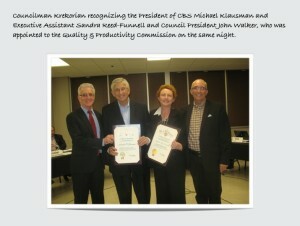 I'm so pleased to share that Councilmember Paul Krekorian stopped by Studio City Neighborhood Council (SCNC) on Wednesday night to recognize the President of CBS, Michael Klausman and Executive Assistant Sandra Reed-Funnell, who have been supporters of the SCNC from its inception. You can read about their history here. Councilmember Krekorian also appointed SCNC President John Walker to the City's Quality & Productivity Commission that night, too! A big congratulations to John!! We are very thankful that another awesome Neighborhood Council leader has been appointed to a City commission and appreciate Councilmember Krekorian for his action. I'll be stopping by SCNC's Green Living Fair tomorrow. If I don't see you there, have a relaxing weekend! Vacant Seats - Who Fills Them? Shoot a Video, Win an iPad Mini, Protect Your Home! 2014 Congress of Neighborhoods: Save the Date and Get Involved!